Above is a photograph of my youngest wearing some clothes that I altered for her. I added applique letters to her top and also with matching fabric I added some large hems (cuffs) to her matching trousers. 1) I found some letters on the internet and printed these out in large onto A4 paper. 2) Then I cut these out to use them as templates. 3) I placed these onto the fabric and traced around them. 5) I then sewed these to the top. Adding the extra hems (cuffs) can be beneficial if you are wanting to make the trouser legs longer. 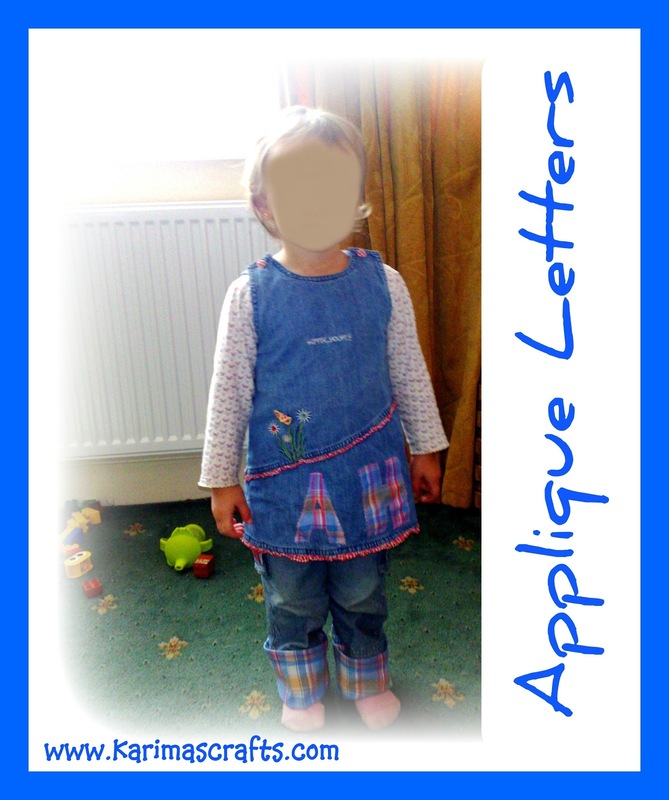 Adding Appliques are also useful to cover any stains that are on your children's clothing. I am following you from the Tuesday Blog Hop. I have a great giveaway this week for a handmade paper mobile, I hope to see you there! That is too cute! Following you back via GFC from The Steady Hand. Thank you. Newest follower from the Hop A Little Tuesday Blog Hop!